A reassuring indication that Saratoga is still a place that’s set in its ways was embodied in the deliciously ironic delivery of two pre-meet announcements. 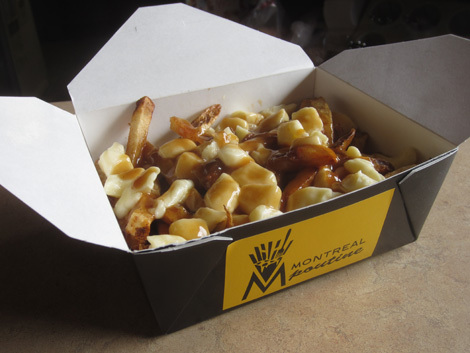 The first was that Shirley’s Restaurant, a newly-established food service provider in the dark, lower Carousel – where few hungry gentlemen have strayed before – will try to draw life to the recesses with poutine, a traditional Montreal dish of French fries with gravy and cheese curds. The second was that anyone who dares eat the heart-stopping culinary creation will no longer benefit physically from the exercise of walking to a betting window. Thanks to the track’s installation of a free Wi-Fi network, nobody, not even an athlete at rest in a lawn chair, has to get up off his posterior. He can just stay put and enter his bet via an iPhone. North America’s oldest racetrack juxtaposes the old with the new in a manner that’s uniquely appealing and, occasionally, confusing. Make too much of a change and it seems like you’ve overturned history. Make no change at all and lose customers. Who wants the job of deciding what move to make? Nonetheless, morale is surprisingly high among New York Racing Association staffers despite a recent insult from Gov. Andrew Cuomo and a failure to get the takeout rate right. That’s a credit to Ellen McClain, who, if rumors are to be believed, is working her last 40 days as COO. NYRA executives, including McClain, are avoiding public occasions at which answers are required. No representative showed up at the Racing Museum’s Preview Night, a panel at which deposed CEO Charlie Hayward and VP Racing Secretary P.J. Campo used to participate in. In their absence, a lot of questions about the sport’s future were thrown at Michael Veitch, a columnist with The Saratogian newspaper. This was supposed to be the summer in which Hayward was to present to the Board of Trustees a plan to subject Saratoga to a significant overhaul. The Board’s vote on remodeling won’t take place until a new Board is appointed by political cronies. The cover of doom is inescapable. Regardless, the racing on tap will be noteworthy. On today’s opening day card, 2-year-old maiden fillies will sprint 5 1/2 furlongs in restricted fields of eight for $80,000 in the third and the fifth. Caixa Eletronica and Jackson Bend meet in the first of the co-featured stakes races – the grade III James Marvin. In the grade III Schuylerville Stakes, Sweet Shirley Mae, owing to the name of the restaurant that’ll be serving poutine, is a hunch bet. 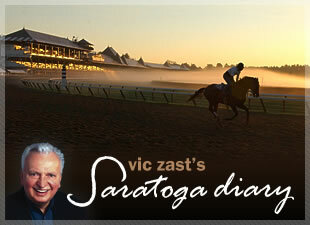 Vic Zast is the author of “The History and Art of 25 Travers.” He’s attended the races in Saratoga for 47 straight summers. 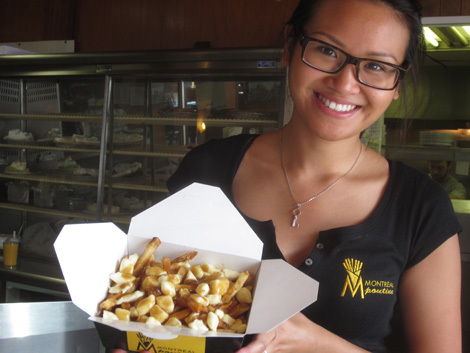 Stephanie Ho-Tran of Montreal, Quebec, Canada, a server at Shirley's Restaurant, serves up a tasty dish of poutine. Saratoga's re-energized Carousel will serve poutine, the traditional Montreal plate of French fries, gravy and cheese curds, at its new the Shirley's Restaurant outpost.